National Livestock Identification System (NLIS) is Australia’s system for the identification and tracing of goats for biosecurity, food safety, product integrity and market access purposes. Throughout Australia, producers are required to know where the goats under their management have come from and where they are going. 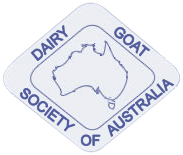 There are currently special arrangements in place for dairy goats – State Branch websites will have more information. You can also visit the MLA website to find out more. The DGSA has a co-operative arrangement for exporting dairy goats to many other countries, including Korea, Taiwan, Thailand, Malaysia and Argentina.